One hundred NUHW food service workers at the University of Southern California’s Keck Hospital are fighting for a fair contract with USC and its subcontractor, Sodexo. USC-Sodexo pays their food service workers poverty wages that force many to rely on taxpayer-funded public assistance programs like food stamps, Medi-Cal, and public housing. Some earn as little as $10.15 an hour, just pennies above California’s minimum wage. In other words, taxpayers are subsidizing USC’s poverty wages. USC–Sodexo’s health insurance plan is unaffordable for most workers, consuming a quarter of their income. Consequently, many workers have no health insurance or must rely on Medi-Cal. And USC–Sodexo refuses to offer these workers the same retirement benefits USC offers to the rest of its so-called “Trojan Family,” leaving most food service workers with little or no retirement savings. USC–Sodexo workers are not asking for any pay or benefits that USC is not already providing to other employees. They are seeking livable wages with starting rates of at least $15 per hour; pay scales that reward employees for their longevity and experience on the job; affordable health insurance for their families; and an annual five percent contribution to their 401(k) plan. “It is fully within USC’s power and means to see that all of its workers, even those employed by subcontractors, are paid a livable wage,” NUHW Secretary–Treasurer Sophia Mendoza told USC’s Daily Trojan newspaper. The University of California, a public university, recently set a $15 minimum wage at all of its campuses, including UCLA and UC Irvine. This includes a requirement that all of the university’s subcontractors also pay UC workers a $15 minimum. The Los Angeles Unified School District, a cash-strapped public school system, also has set a $15 minimum wage, including for its food service workers. This means that all cafeteria workers making food for L.A. school children make at least $15. Meanwhile, wealthy, private USC refuses to guarantee a $15 minimum for the workers who prepare and serve meals to 10,000 patients and their families annually at USC’s Keck Hospital. 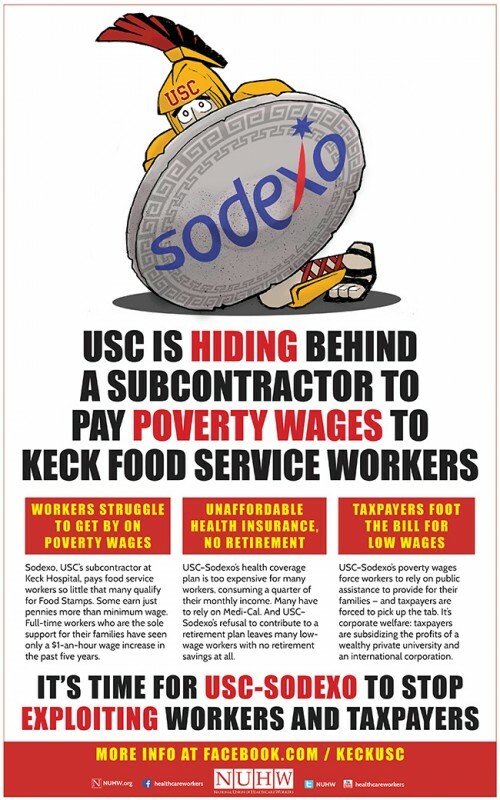 USC, with its $4.6 billion annual endowment and nearly $5 billion in annual revenue, can certainly afford to pay its food service workers a livable wage, as can Sodexo, which reported $1.3 billion in profits last year and is one of the largest private employers in the world. “The real solution is for USC to stop exploiting these workers via Sodexo by bringing them back in-house and treating them as full members of the Trojan family, with full Trojan pay and benefits,” Mendoza said.